Velan has built-in redundancy for all mission critical resources. Multiple internet links with firewall & antivirus system, captive power generator, uninterrupted power supply system and stand-by systems along with branded computers and structured networks allow Velan to deliver uninterrupted service round the clock. 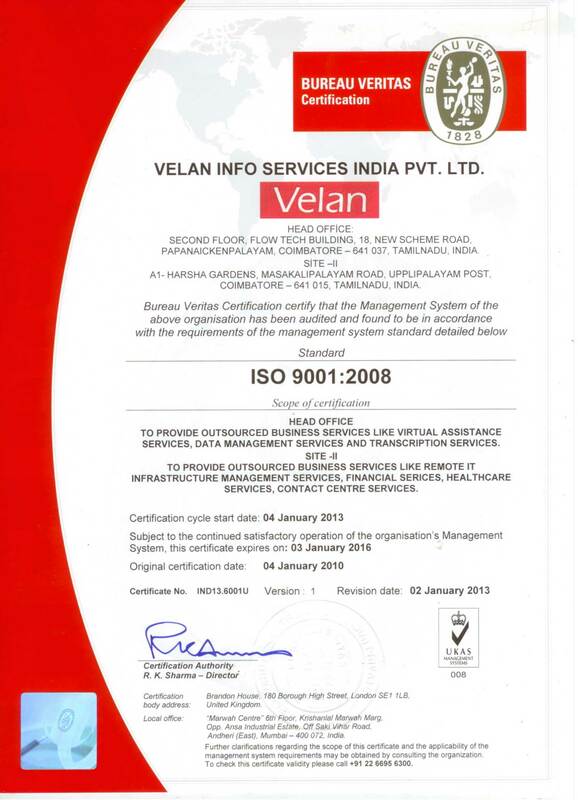 Velan takes utmost care for the data processed by strict adherence to security standards. Non-disclosure agreement imposed to the employees, access restriction to duplicating devices and 24x7 manned-security are some of the administrative, physical and technical safe guard measures in place. We constantly explore "out of square" ideas and ways of doing things. We will regularly seek customer feedback and act upon it. We will create customer friendly procedures and always respect deadlines. Velan have served various verticals with 100% satisfied clientele, we have not lost a single client on account of poor delivery. This makes us to receive repeated projects from our long term clients. We have been growing at well above the industry average, with most of the growth coming from our existing clients. Velan operates at 75% of its plant capacity. There is scope to increase the resources to another 100% in a short notice. Our mission critical resources are well designed and installed to meet the expansion needs of the organization with out compromising performance. Understating the client requirements to the best reach and to provide end to end solutions across the value chain. Redundant infrastructure to consistently maintain availability, integrity and security of the information processed and stored. Well defined polices to meet the industry standards. We understand and believe only continual enhancement and value addition of process, peoples and resources will make us to retain in fulfilling dynamic industry changes and requirements of our clients. Velan Continual Learning Program makes our staff to learn basic values in their life and priorities in work. Exercises and interactive learning programs make one to enrich their competencies along with current standards and practices in the industry. Continuous learning is the ability to learn new emergences and to meet the change requirements in our operations. We deliberately concentrate on select industries and develop process and methodologies to suit the requirements by our clients. We proactively strengthen our competencies in these segments by using best technology and leadership resources in the industry. Our focus is on developing and retaining the best talents to exhibit our expertise across all operations, which in turn benefits our clientele to have a competitive edge in their Businesses. Velan understands the significance of securing customer data in all phases of its operations. We take utmost care to protect customer property not only in the product realization process but also in storage and logistics.